I love the Lakes, and I love Langdale valley. It’s my favourite spot. 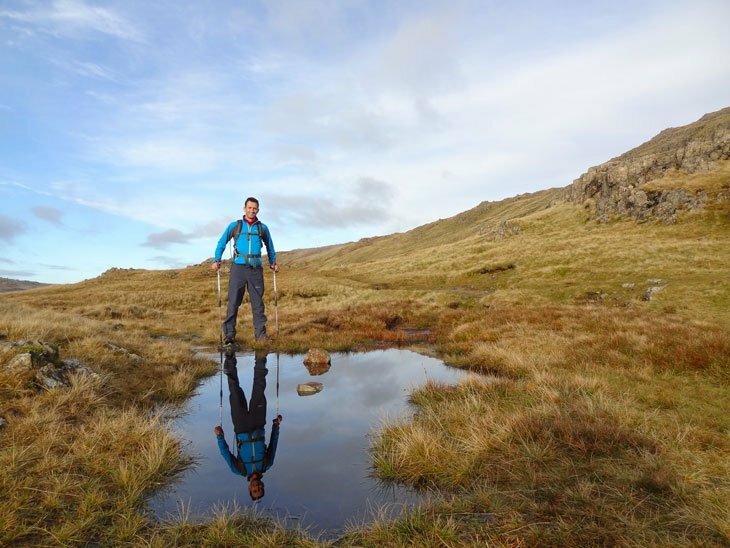 I’ve been coming to the Lake District for years and I have walked, scrambled, and climbed up most of the major peaks there, but I don’t think I’ve ever visited the Lakes and been able to resist visiting Langdale. 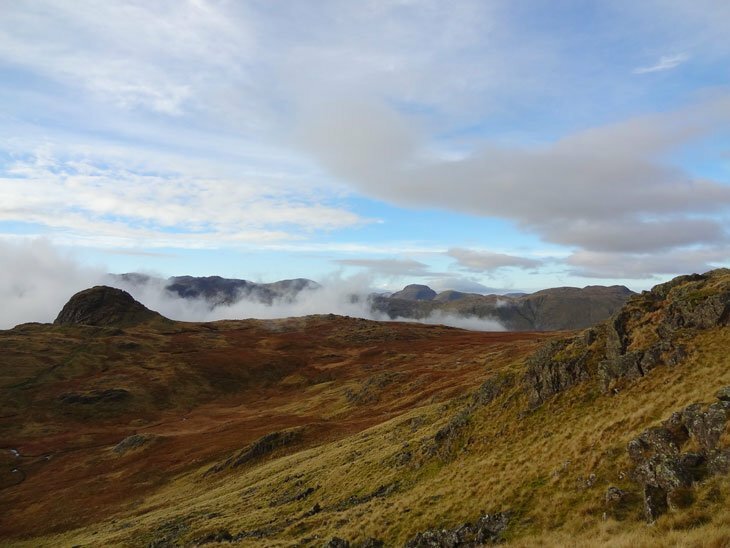 It has everything that is great about the Lake District; good pubs, beautiful scenery, and walks to suit all tastes. 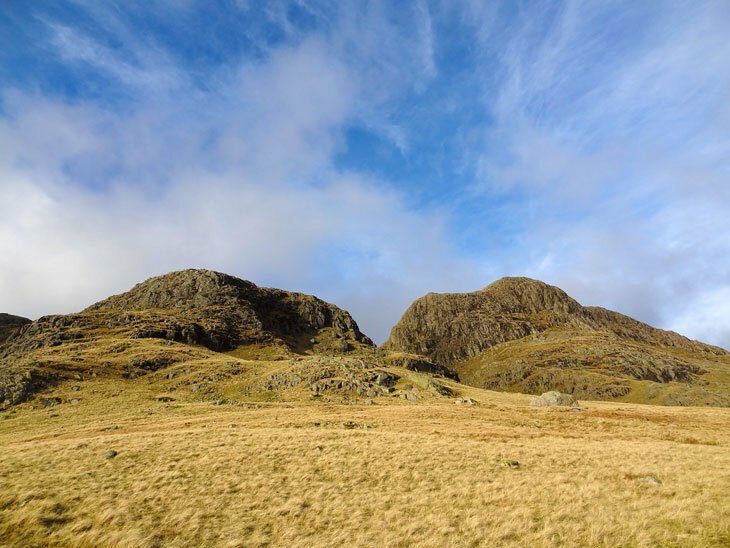 I have always thought that the Langdale Pikes themselves are the most iconic peaks in the Lakes. I love the way that that they stand proud, like they are on guard, watching over the valley and keeping order. They are always the first thing that I look for when I’m on the road between Windermere and Ambleside. This day was no different, and as soon as I saw the Pikes and the moody clouds swirling around them, I knew that my early morning trip from Salford was going to be worthwhile. 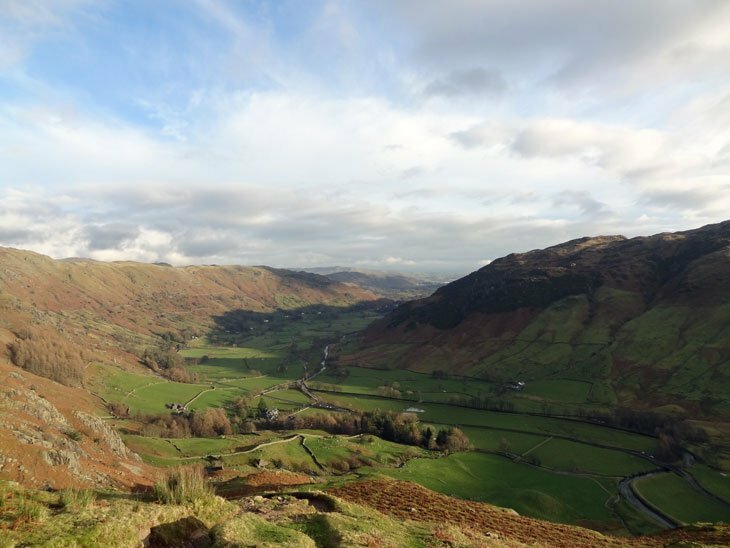 Langdale valley changes colour throughout the year, but Autumn is always my favourite time to visit. The fells are golden brown, and there is always a great light, the only problem being that there are not enough hours of it on short November days. 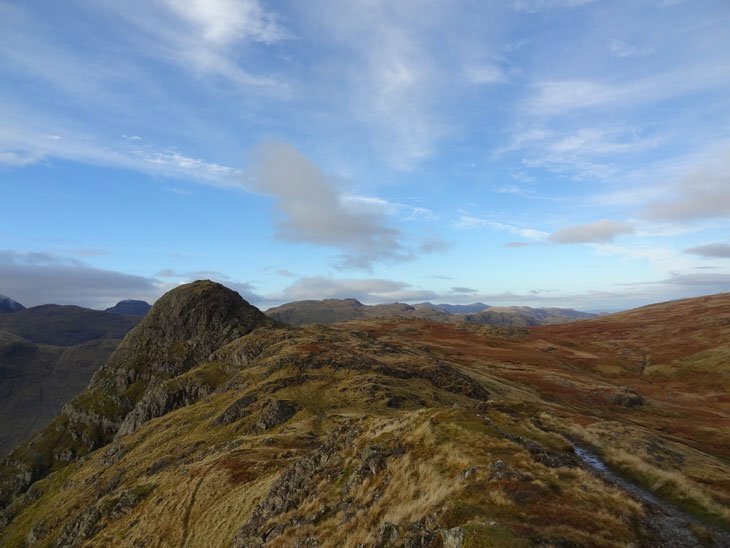 Our walk, which took us from the New Dungeon Ghyll pub up to Stickle Tarn, up and over Pavey Ark, Harrison Stickle, Pike of Stickle, and down again gave Paul and I the chance to catch up, as well as the treat of some dramatic views. Paul and I have done a few small walks around Saddleworth before, and a slightly longer stroll up Kilimanjaro. I’ve climbed up mountains all over Snowdonia, Scotland, Glen Coe, the Cuillin on Skye, the Alps, and the Dolomites. Being in a Scout group as a kid in Salford gave me access to the great outdoors and it is still the best gift I have ever been given. The first mountain walk I ever did with the Scouts was Snowdon via Crib Goch, an introduction to mountain walking that can make or break you. Thankfully for me, it got me hooked and I haven’t looked back since. I still see the guys that I walked with on that day. The mountains are great medium for bringing people together and for maintaining friendships over a lifetime. 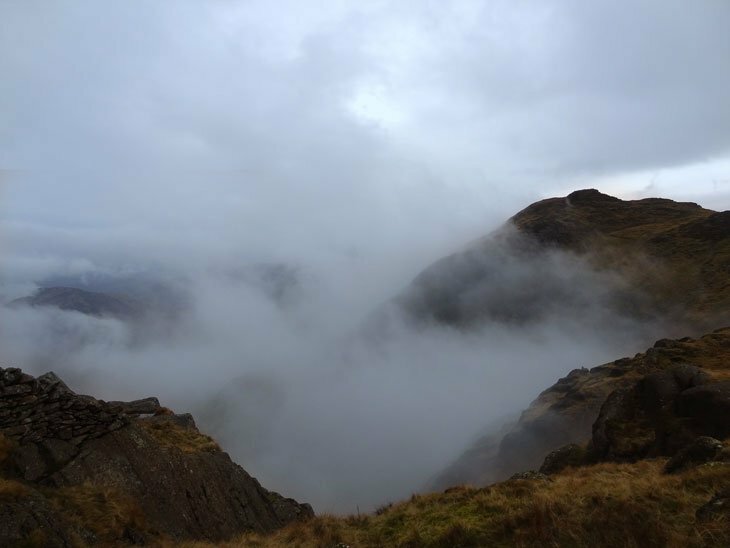 There was the odd flash of blue sky above us while we were having our lunchtime butties in the mist on Harrison Stickle, then as we walked towards Pike of Stickle the cloud that had been sat in the Mickleden valley shifted and gave us the view of the day. Crinkle Craggs and Bowfell, with the Scafell range sitting behind. The surrounding clouds and the setting sun making it look all the more dramatic. Time for some photos and to sit and take in the beauty. This is what we walk up hills for. And then it was time to head back down. Sun on our backs, chewing the fat on trips passed and those to come, and before we knew it we were back in the car park to say our goodbyes before heading off our separate ways. 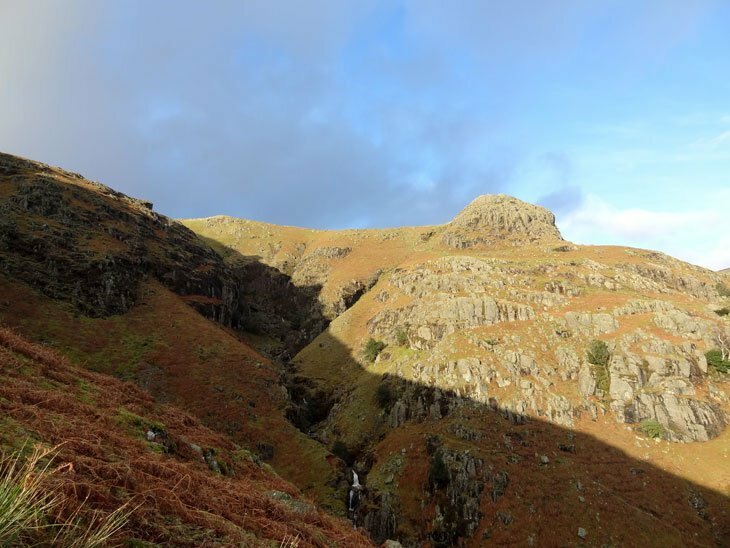 Another great day walking in the Langdale valley. It won’t be my last. WOW looks fantastic wish I was there! I love it when I see a new post of baldhiker and know that there will be wonderful pictures and comment.Don’t ever stop sending them! Glorious! I’d have to set up my easel, but you do great with the camera. 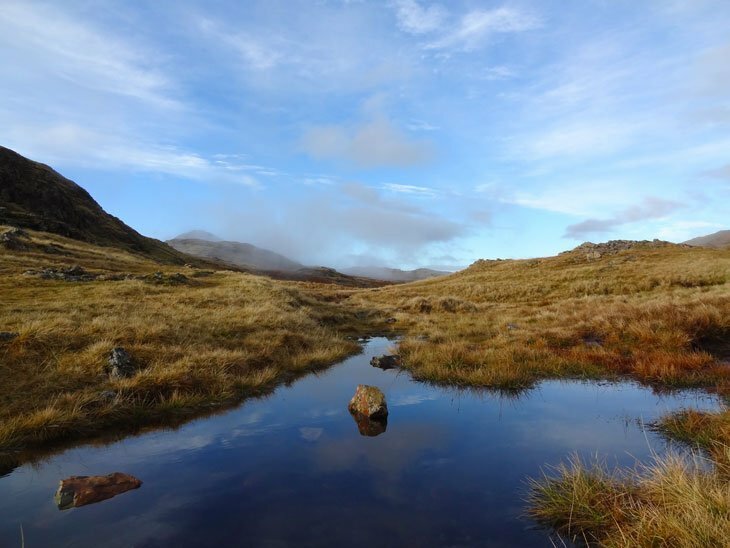 Beautiful pictures – and such a dreamy, deserted landscape right out of Wordsworth. It should have been a very nice walk in these mountains! Nice article Mr Taylor. 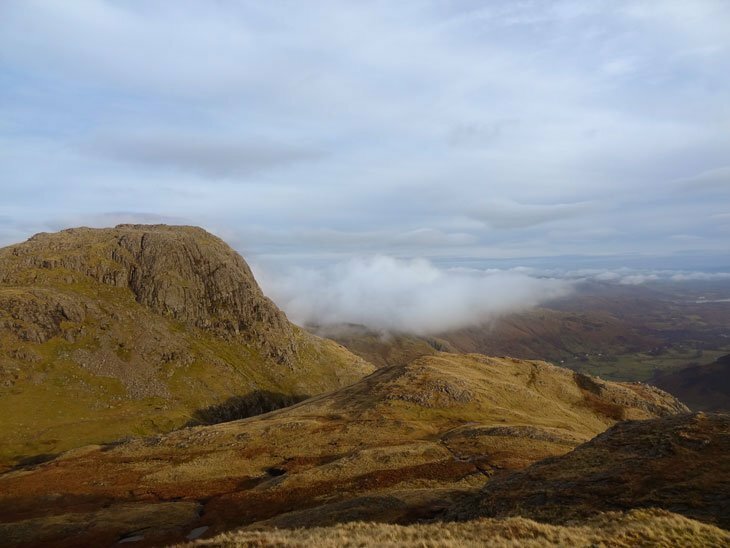 Would love to walk teh Langdale area – its the one part of the Lakes I’ve yet to explore properly. See you tonight for a few pints and a catchup!